The worst problem that LAUSD faces is none other then its hostility to real pragmatically driven change to address the subjective needs of its students. Sadly it sees this as a challenge to its bloated and self-serving privilege. For some reason, this makes me think about the American way of death as depicted in a film from 1965 called The Loved One from a novel by Evelyn Waugh. In the story Jonathan Winter as the owner of a Forest Lawnesque cemetery and mortuary realizes that the land on which the cemetery is built is worth a fortune and laments, "How do I get these stiffs off of my land." In my 15 years with LAUSD, I have found a similar attitude expressed toward students and teachers by LAUSD administration that seems more concerned with spending money for all the interests feeding at the LAUSD trough than it does for actually engaging in the meaningful and rather straightforward process of educating young people. The environment that results is not only not conducive to education. In fact, it is downright hostile to anything that even smells like real change, which ironically creates one of the most anti-intellectual environments I have ever experienced. Several years ago, when LAUSD acquired and demolished the old Ambassador Hotel site in the Mid-Wilshire area, I proposed an international school like the one I had been involved with for 7 years, when I lived in France. Although my proposal was included in the environmental impact report, nobody ever contacted me about the proposal nor did I ever have the feeling that LAUSD was open to ideas on what to do with the site. I must emphasize that my proposal was not something that was untried, but rather a vibrant multilingual and multicultural system of education that has been up and running in France since shortly after the Second World War. Given the multi-ethnic nature of Los Angeles, it seemed a natural way to build an education system that valued our diverse population's cultures of origin, while integrating them into an ever changing and highly competitive American identity of the future. Although I have shared this idea with many at LAUSD including superintendents Romer and Brewer, I have never even received the courtesy of a response, which seems to be typical of any reform that doesn't originate from within LAUSD. What follows is how this system could function in Los Angeles. 333 S. Beaudry St.Los Angeles, CA. The following is a proposal I made several years ago to use the Ambassador Hotel site or any other appropriate site as an international school educational facility. I believe it is viable project for realistically addressing the linguistic deficits of LAUSD students. LAUSD is supposedly searching for a way to address our students' poor academic abilities and yet no one in the District has ever given me a reason why the following project would not work in Los Angeles. As you read the following proposal, realize that I am not asking you to try some untested idea. This international school has been up and running for the last 50 years in France. I would be happy to buy you a ticket and arrange for you to see this school in the western suburbs of Paris. In the following proposal, please realize that English should be substituted in a Los Angeles context for the French model that I describe.I would be happy to meet with you, if you would like to examine some brochures from the various national sections at the Lycée International or to ask more questions on how this model of education might function in an American context. If you require any further information to effectively consider this proposal, please don't hesitate to contact me. Why is the French Lycée International model specifically applicable to a Los Angeles reality and why would the Ambassador site be the best location to implement this plan? Developing the Ambassador Hotel site into a multicultural learning center is advisable because of the hotel's central location in the Mid Wilshire district of Los Angeles. This central location offers a neutral neighborhood, close to Korean, Latino, Russian, Iranian, and African American communities that would focus all the diverse cultural elements of Los Angeles into a reinfusion of culture and tolerance into the central city. In addition to the educational goals that would be addressed by this project, bringing large groups of people into the Mid Wilshire area would have an enormously positive affect on the present depressed economic reality of the Mid Wilshire area, since it would give the existing businesses in the area the benefits of people being drawn to the area from all over the city for educational reasons, but at the same time shopping, eating, and supporting services in the Mid Wilshire area where their children were now going to school -- a true sense of community would develop around the school. The following is a proposal to develop the Ambassador Hotel site into an educational complex that will more effectively address the education of Los Angeles' diverse ethnic populations, while at the same time serving to economically revitalize the Mid-Wilshire community. 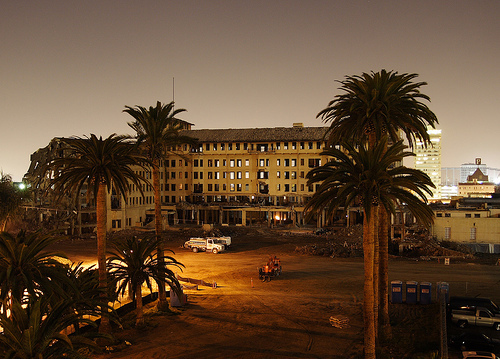 Developing the Ambassador Hotel site into a multicultural American learning center is advisable because of the hotel's central location in the Mid-Wilshire district of Los Angeles. This central location offers a neutral neighborhood, close to Korean, Latino, Filipino, Pacific Islander, Vietnamese, Russian, Iranian, and Black communities that would focus all the diverse cultural elements of Los Angeles into a re-infusion of culture and tolerance in the central city. In addition to the educational goals that would be addressed by this project, bringing large groups of people into the Mid-Wilshire area would have an enormously positive affect on the depressed economic present reality of the Mid-Wilshire area, since it would give the existing businesses in the area the benefits of people being drawn to the area from all over the city for educational reasons, but at the same time shopping, eating, and supporting businesses that offer goods and services in the Mid-Wilshire area where their children were now going to school. The International School would continually produce culturally sensitive student cadres for certain communities by supplying the linguistic and culturally based social structures that are significantly diminished in low achieving ethnic groups in the greater Los Angeles area. This in turn would indirectly address the violence in these communities that has filled the vacuum that exists when community institutions are not developed. The infusion of varied minority groups into all represented national sections could not help but encourage a higher level of educational achievement in these communities, while at the same time build bridges of mutual understanding. Restructuring the existing Ambassador Hotel into an International School complex would develop the social maturity in Los Angeles of maintaining our architectural heritage as opposed to demolishing it in favor of a generic commercial center of questionable value in an area that is already saturated with under-utilized commercial space. Since inner-city life exists in a reality that knows little of the world beyond its borders and is distrustful of anything that challenges its known reality, the new model of education must tempt the curiosity of inherently intelligent students that have gone for too long under the present educational system without reaching their academic potential. I propose an International School model (pre-kindergarten through 12th grade) on the present 23-acre Ambassador Hotel site, that proactively confronts the presently low level of English language literacy that is endemic in a significant number of our Los Angeles schools. Much of the model I propose is derived from the Lycée International, which has existed in France, since the end of the Second World War. What I have attempted to do here is modify that proven and functioning educational system to take into account the different social and cultural realities presented in a Los Angeles context. The general idea of an international school is to use a dual immersion approach to education that contemporaneously teaches students their native language and culture of origin, while at the same time integrating these students into a standard-English based American society. At the same time, this program will seek to meaningfully integrate significant segments of Los Angeles' minority students into this International School. The foundational premise of this approach is that language and culture once mastered in any linguistic milieu are freely translatable into any other. The international school actually consists of two schools, or a school within a school, where students receive a traditional American education for four days a week in classes that are a mix of all component national sections. Subsequently, the student body of the regular school would divide into separate national sections (Mexican, Iranian, Filipino, Russian, Korean, etc.) for two half-days a week, where they are educated in their national section native language and culture of origin. 4. American students who have no cultural or linguistic tie to the foreign country, other than a desire to become fluent in the language and institutions of that country. Exclusively American students that enter any of the national sections will do so in order to broaden their intellectual horizons by making them aware of realities outside of their own communities. The inevitable process of comparing this new frame of reference to their own will allow them to think of themselves in less absolute terms, which will give them the opportunity to grow intellectually by increasing their life perspective. It is anticipated that there will be a significant period of transition for exclusively American students, until they are represented at every grade level in the national sections. This will be necessitated by the reality that the only logical point of insertion for purely American students, without background in a foreign language and culture, is in the pre-kindergarten through 1st grade (prior to 6 years of age). In an attempt to shorten this period of transition, LAUSD and the national sections might try sponsoring summer total immersion programs in the country of origin. Countries like Israel, France, Mexico, and other countries already have such programs that might develop the requisite fluency for acceptance into a national section at the International School of Los Angeles. In recognition of a potential lack of linguistic fluency in standard English of both foreign and American born students, all students seeking admission to the International school would be given an appropriate grade level examination to see if a sufficient ability in English language skills exists to fully benefit from the International School program. If the requisite level does not exist, a provisional acceptance to the International School would be given. These provisional students would fall in two categories: students who have enough level in English to follow the regular school and nation section programs, while receiving supplemental full Special English instruction and those students that would follow full immersion Special English courses in all subject matter areas in lieu of the regular school, while continuing to attend the national section classes. What would make these Special English classes different than the standard, non-competitive, classes in which too many African American and Latino kids lose their self-esteem, is the reality that recently arrived students of generally higher socio-economic origins would also be taking the "Special English" course. These students would naturally look to African American and Latino students to translate the American cultural idiom for the foreign born students -- this would give prestige and pride to American kids taking "Special English." After one year, "Special English" students would either join the regular program or receive a second year of "Special English," if the level is still not sufficient to allow success in the regular International School. It should also be noted that a greater commitment of time for some students taking Special English might be required if they are competent to follow national section classes, the regular school classes and Special English. A prerequisite for admission to the regular school shall be admission to one of the national sections. 60% of admissions to any national section shall be reserved for students who are citizens of the country represented by the national section or who have appropriate grade level fluency necessary to sustain the foreign language and cultural environment of the national section. 3. The full and meaningful social and economic integration of both immigrant and native populations into a dynamic American society. This 40% of exclusively American eligibility shall further be divided into two groups of 20% each. The first group of 20% shall be for all exclusively American students, while the second 20% shall be reserved for exclusively American students that come from the lower socio-economic strata. Given the deficiencies that these students have and the disproportionate amount of nurturing that they will require in order to be successful at the International School, 20% is arguably the highest percentage of these disadvantaged students that can be effectively integrated into the program. Finally, it must be understood that this "60%-20%-20%" formula can only be viewed as the ultimate desired proportional representation of the International School that can only be achieved after an initial transition period. This is anticipated due to the time necessary to develop a linguistically fluent exclusively American student population, that must first move through the twelve grade levels of the school before they will attain their full representation in the International School population. In order for a specific national section to be represented at the International School, a non-profit organization charter must be obtained from the State of California in conjunction with the Los Angeles Unified School District. The national section charter shall also set forth by-laws that will be agreed upon by the parent stakeholders of the national sections. In addition to the charter, the aforementioned by-laws shall be subject to approval by the appropriate authorities at the State of California and LAUSD. There shall be two types of national sections: national sections that are partially subsidized by the country of origin and national sections that are exclusively a part of the existing public school structure in California. The State Board of Education and LAUSD shall have the final authority under which status a national section shall exist. Each national section will have a board of directors that will be chosen by the parent stakeholders of the national section, the board of directors will then choose the director subject to approval by the LAUSD. The directors of all sections shall be under the Principal of the International School, who shall be an employee of LAUSD. Teachers of the national sections must qualify under both California credentialing regulations and under the regulations in force in the country of origin of the national section for which they work. This will allow students in the national sections to have their class work count under both California and foreign educational systems. Wherever possible, foreign teachers from the country of origin shall be given emergency credentialing where there are no qualified and credentialed teachers in California. 3. Are there enough students from pre-kindergarten to 12th grade to ensure at least one class at each grade level for this national section. The International School will only have national sections for the countries of origin that succeed to the greatest extent in fulfilling these three criteria. In any case, LAUSD will make the final decision as to which national sections will exist at the redeveloped Ambassador Hotel site. It is anticipated that this model of dual immersion education will be implemented at other appropriate ethnically diverse sites throughout California. International School will have a School Director and three separate principals that will administer the pre-kindergarten/elementary school, the junior high school, and the high school. The responsibility of these administrators will be to run their respective regular schools within the International School structure and to oversee the functioning of the national sections that will have their own directors and administration. In order for our educational system to succeed in a context of insular minority populations, our basic model of education must be restructured to nurture these minority cultures. If we succeed in this ambitious endeavor, the result will be an American culture that is revitalized by the same ethnic diversity that has always been the greatest source of our creativity as a people. What do you think? We want your input!